Image caption Thuirt Ceannard nan Làbarach gu bheil na Tòraidhean "roinnte agus dì-mhisnichte" agus rinn e tuairmse gun robh riaghaltas Làbarach "air an t-slighe". Tha Ed Miliband air cur às leth an SNP gu bheil iad a' feuchainn ri luchd-bhòtaidh na h-Alba a "mhealladh" gus creidsinn gur e neo-eisimeileachd an aon dòigh san tèid ceartas sòisealta a choileanadh. Thuirt Ceannard nan Làbarach gu bheil na Tòraidhean "roinnte agus dì-mhisnichte" agus rinn e tuairmse gun robh riaghaltas Làbarach "air an t-slighe". Thuirt e cuideachd gun leanadh an SNP orra le poileasaidhean Tòraidheach an dèidh neo-eisimeileachd. Bha Mgr Miliband a' bruidhinn fhad 's a bha am Prìomh Mhinistear Ailig Salmond cuideachd a' foillseachadh an t-seallaidh aige-san de dh'Alba nas cothromaiche. Le dìreach cola-deug ri dhol ron referendum air neo-eisimeileachd na h-Alba, agus cunntasan-bheachd a' sealltainn gu bheil cùisean a' fàs nas teinne, tha gach taobh air a bhith a' dèanamh oidhirp air bhòtaichean nan Làbarach nach eil fhathast air co-dhùnadh dè an taobh a bhòtas iad a bhuannachadh, le mòran den bheachd gum bi iad air leth buadhach. Chan eil ann ach mealladh SNP. Tha iad a' dol a' leantainn orra le poileasaidhean Tòraidheach ma gheibh iad neo-eisimeileachd. A' bruidhinn ris a' BhBC, thuirt Mgr Miliband gur e "ro-innleachd annasach" a th' air a bhith aig an SNP ann an iomairt an referendum. Lean e air: "Tha iadsan airson innse do dhaoine nach dèan duine an gnothach air na Tòraidhean san RA. Tha mise airson a ràdh gun dèan. "Tha mise ag iarraidh dùthaich nas cothromaichte, nas co-ionainne. Tha mi mothachail gu bheil an t-uabhas dhaoine ann an Alba a' faireachdainn nach eil an rìoghachd ag obair dhaibhsan agus gum bi iad a' cnuasachadh co-dhiù am bu chòir dhaibh bhòtadh 'Cha Bu Chòir' anns an referendum no 'Bu Chòir'. "'S e mo theachdaireachd làidir-sa gum gu chòir bhòtadh 'Cha Bu Chòir' anns an referendum seach gu bheil riaghaltas Làbarach air an t-slighe, riaghaltas Làbarach le molaidhean dha-rìribh a thaobh ceartas shòisealta." 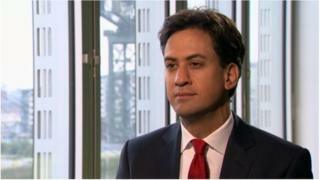 Tha Ed Miliband agus Daibhidh Camshron cho coltach ri chèile ri dà sgadan. Agus nach eil fhios gu bheil am Pàrtaidh Làbarach air gealltainn leantainn orra le poileasaidhean cruaidh a' Phàrtaidh Thòraidheach. Thuirt Mgr Miliband gun robh na Làbaraich daingeann ann a bhith a' cruthachadh siostam chìsean nas cothromaiche, le reat ùr 10sg agus reat 50sg nas àirde, a thuilleadh air a bhith a' reothadh phrìsean cumhachd, ag àrdachadh a' bhun-thuarasdail, a' cuideachadh dhaoine òga gus obraichean fhaighinn agus a' toirt barrachd chumhachdan do Phàrlamaid na h-Alba. Rinn e argamaid gum biodh aig an SNP, air an làimh eile, ris a' chìs chorporaid agus buidseatan poblach a ghearradh an dèidh neo-eisimeileachd, agus nach tigeadh aca air na tha na Làbaraich a gealltainn a thaobh reat cìse 50sg no reothadh a thaobh phrìsean cumhachd a choileanadh. "Gu h-onarach, chan eil ann ach mealladh SNP. Tha iad a' dol a' leantainn orra le poileasaidhean Tòraidheach ma gheibh iad neo-eisimeileachd, sin an ro-shealladh a th' aca dha-rìribh. "Ma tha thu ag iarraidh ceartas shòisealta bu chòir dhut bhòtadh 'Cha Bu Chòir' agus tha sinn a' dol a thaghadh riaghaltais Làbaraich." An dèidh bruidhinn ris a' BhBC, bha Ed Miliband ag iomairt ann an Siorrachd Lannraig a Deas, cuide ri ceannard Làbarach na h-Alba, Johann NicLaomainn. Aig a' cheart àm, bha Ailig Salmond ag iomairt ann an Glaschu cuide ris an Leas-Phrìomh Mhinistear, Nicola Sturgeon, 's iadsan a' comharrachadh 10 bliadhna chun an là bho chaidh an taghadh mar cheannard is leas-cheannard a' Phàrtaidh Nàiseantaich. Image caption Bha Ailig Salmond agus Nicola Sturgeon a' comharrachadh 10 bliadhna chun an là bho chaidh an taghadh mar cheannard is leas-cheannard a' Phàrtaidh Nàiseantaich. Thuirt am Prìomh Mhinistear gur e an sealladh airson na bliadhna 2024, Alba neo-eisimeileach "far a bheil cothrom aig a h-uile duine a bhith soirbheachail, agus far am bi cothroman ann don mhòr-chuid, seach a' bheag-chuid". Mar fhreagairt do bheachdan Mhgr Miliband, chuir Mgr Salmond às leth Ceannard nan Làbarach gun robh e "san leabaidh cuide ris a' Phàrtaidh Tòraidheach" agus gun robh còrr is 200,000 luchd-bhòtaidh Làbarach an dùil bhòtadh airson neo-eisimeileachd. Thuirt e cuideachd: "Anns an iomairt a tha seo, tha Ed Miliband agus Daibhidh Camshron cho coltach ri chèile ri dà sgadan. Agus nach eil fhios gu bheil am Pàrtaidh Làbarach air gealltainn leantainn orra e poileasaidhean cruaidh a' Phàrtaidh Thòraidhich. "Chan eil creideas sam bith aige air fhàgail. Air a' chaochladh, tha sinne air poileasaidhean a thaobh ceartas shòisealta a stèidheachadh ann an Alba, mar eisimpleir, an tuarastal bith-beò." "'S iad sin na poileasaidhean a tha Alba ag iarraidh oir tha Alba airson a bhith comasach air eaconamaidh nas sealbhaiche a chruthachadh, ach cuideachd sòisealtas nas cothromaiche. Sin an rud dha bheil daoine a' bhòtadh nam mìltean, tha iad a' gluasad a dh'ionnsaigh na h-iomairt Bu Chòir, 200,000 a b' àbhaist a bhith a' bhòtadh do na Làbaraich nam measg."